Multi-Stage filtration for external Use with ponds up to 1000 gallons. Contemporary design and modern style makes this fountain a great conversation piece. Functional art for the yard. Includes LED accent lighting. Easy to assemble, comes complete with everything you need, including an energy efficient pump. If you are looking for a piece of outdoor decor that will bring a true sense of beauty and sophistication to your garden, then the Sunjoy Iron Kinetic Spinner is a superb choice. Radiating from the center pole of the spinner are two opposing curved rows of arms that are each attached to their own delicate metal leaf. The rows each form a gentle spiral shape that makes this piece come alive when set into motion by even a slight breeze. When the wind blows, the leaves reflect light and the rows rotate to create a hypnotizing, seemingly infinite twisting effect. Because of the large size of this twisting wind spinner and the spectacular optical illusion that it creates, this garden ornament truly serves as both a statement piece and focal point for any outdoor grassy area. Constructed out of iron, the garden spinner is weather resistant and requires low maintenance care. One of the best and easiest ways to add some fun and visual interest to your garden is with a brightly colored wind spinner. With its gorgeous design and rich color, the Sunjoy Large Blue Kinetic Iron Garden Stake is the perfect choice for beautifying any grassy outdoor space. This garden spinner boasts a lovely blue color and, thanks to subtle variations in the shading, the blue hue evokes the color of a tranquil ocean or a deep blue summer sky. The spinner also features a playful pinwheel design. Simply wait for a soft breeze and watch this spinner twirl and whirl. While this blue wind catcher looks dainty and delicate, it features rugged construction to help protect it from the elements. Create a marvelously sophisticated ambiance in any outdoor area with the elegant Sunjoy 19 Inch Cast Birdbath. This gorgeous birdbath features an exquisite design and plenty of details designed to inspire and delight. Constructed out of durable cast iron and weather-resistant aluminum, this birdbath features a lovely antique finish that will only grow more beautiful with age. While the sturdy birdbath is held up by a striking circular base with a beautiful open scrollwork design, the most distinctive feature of this birdbath is its charming bathing bird detail. Rising out of the bowl of the birdbath is a small tree branch with a warm brass finish and intricately detailed leaves. Perched upon the branch is a solitary little bird thoughtfully looking up to the sky, perhaps waiting for some friends to join him. 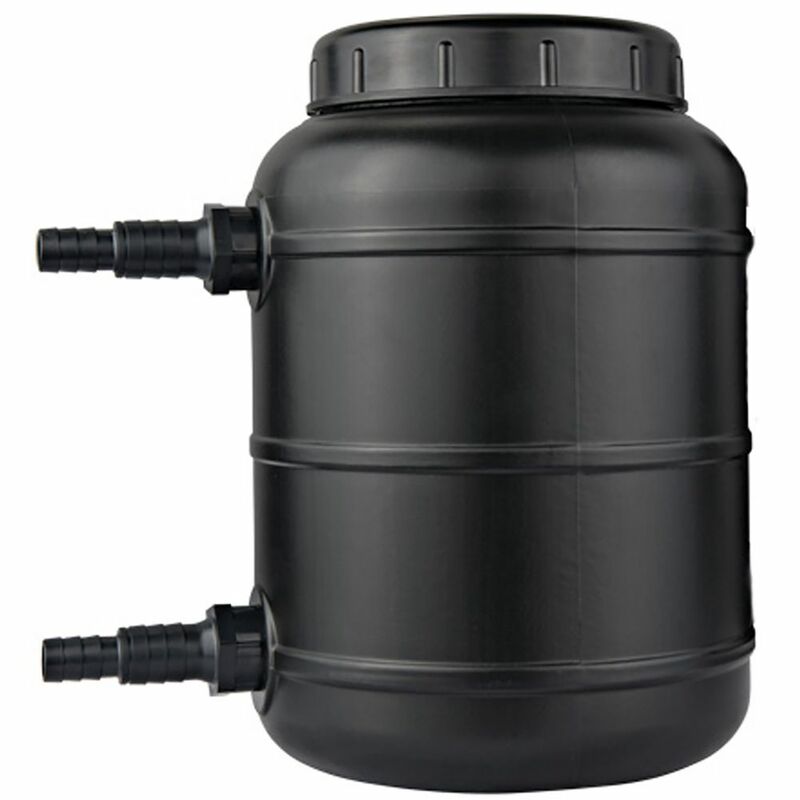 1000 Biological Pressure Filter Multi-Stage filtration for external Use with ponds up to 1000 gallons. 1000 Biological Pressure Filter is rated 3.0 out of 5 by 9. Rated 1 out of 5 by Annma from Disappointed Didn't come close to the recommendations specs. Don't waste your money. Have had other filters-this one is useless! Rated 4 out of 5 by none from just installed I bought this filter for a pond that was just finished at the end of August and have had no issues with it ,but this is going to be a long term item ,I will need to live with it for a while in order to form a more complete opinion but it functions as intended. Rated 1 out of 5 by Taid from I regret this purchase I encountered three problems. 1. The 1" adaptor is oversized - had major problem fitting my 1" pipe. Needed much force and my wife's hairdryer. ( No problem at the pump end - so not the pipes fault ). 2. It leaked at both pipe attachments. Only two gaskets supplied - it needs four. ( Hard plastic to hard plastic connections will leak!). Found some 1 1/4" gaskets at local hardware store. My pump is only 600 gph - manual states unit can handle 2000 gph. I don't think so! 3. Design has a tube inside the casing over the filters making filter removal impossible without removing the incoming water fitting. Repeated removal of this fitting will eventually lead to leaks. I opted to not install this tube. This is a poorly designed product. Rated 5 out of 5 by Carole from Pond filter This filter can handle more gal per min. than the one they carry in the store. It is worth ordering online for a small pond. Rated 5 out of 5 by Retired from Easy to install, pond is crystal clear On a 700+ gal rock-lined pond with water plants, gold fish, and waterfalls, the inline filter worked great. Before installation, the pond water was thick and green. Couldn't see the fish at all. Our 100 degree weather and sun had turned it into a science experiment. We drained 1/2 the water, installed the filter and turned on the pump. Emptied the filter of crud a few times and then filled the pond and let it go. After a couple days, the water was crystal clear. Rated 1 out of 5 by karlb from Not happy with the product I would not recommend this product for a use similar to mine, which was pumping at about 1000 GPH. After 2-3 weeks it started leaking and I was not able to stop the leak. It occurred at night and the next morning the pond was half empty. In my opinion it is not a good design because it is very difficult to tighten the lid, also it is almost impossible to clean without dismantling the whole filter. Rated 5 out of 5 by 1066L from Pond Filter Very easy to assemble and easy to clean.For the first time in 4years my 300 gal pond is completely clear.